Representatives of the Coul Links public inquiry and the two Scottish Government reporters on the earlier site visit. Picture by Sandy McCook. The leading witness for the opposition group to the proposed Coul Links championship golf course development took to the stand yesterday as the government led public inquiry entered its 13th day. 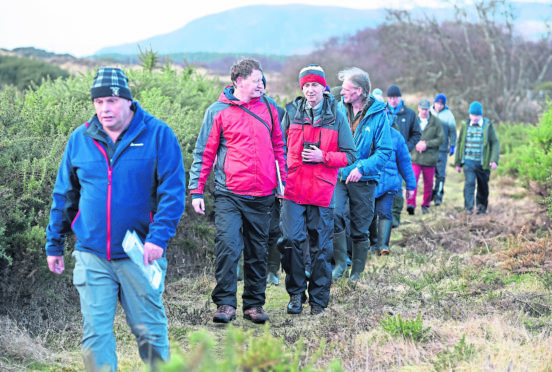 Dr Tom Dargie, an independent environmental scientist and chairman of the Not Coul group, provided evidence at a packed Carnegie Hall in Clashmore, as around 40 members of the public gathered to witness the day’s events unfold. The Not Coul chairman’s evidence was based upon the impacts a development at Coul would have on ecology, hydrology and ecohydrology. Dr Dargie said: “The applicant’s environmental work for this proposed golf course at Coul Links is deficient. “It has failed to recognise the changing nature of the site and the drivers of that change. Questions were put to Dr Dargie relating to allegations made by applicant’s witnesses during their evidence sessions regarding his work, with the Not Coul chairman refuting these claims. Ailsa Wilson QC cross-examined Dr Dargie during yesterday’s afternoon session, questioning the ethics of his evidence as he stated he was providing evidence as an independent environmental scientist and this did not conflict with his role as part of the Not Coul group. Reference was made to the two objections Not Coul submitted in relation to the proposed development, which Dr Dargie had been involved in bringing together. Ms Wilson also questioned Dr Dargie’s failure to consider the findings of experts on behalf of the applicant that suggested alternatives to his findings, instead, setting these aside, which Dr Dargie agreed he had done. Ms Wilson said: “That doesn’t suggest impartiality. That doesn’t suggest that you reflected on that evidence and then went away and checked on things. The cross-examination of Dr Dargie resumes today at 9am.